It’s well known in these parts that hanging round cemeteries is one of my guilty pleasures. Unsurprisingly I have many more, most of which I’ll keep to myself if you don’t mind, thanks for asking anyway. But there is one other I’m prepared to admit to: old British horror movies. For me, the golden era is the 1950s to the mid-seventies, and I’m particularly fond of the classic Hammer and Amicus pictures. Way back in the seventies when I was a kid we were lucky enough to have a second TV, an old beat up black and white portable that a family friend had given us. It didn’t have any buttons for the channels, just a dial that you had to twist to tune in to one of three stations – that’s all we had in the UK back in those days. Most of the time this TV lived in the kitchen where it kept my mum company whilst she cooked, but on the weekends I was allowed to take it up to my room on the condition it was lights out and TV off by ten. Dear Mum, in the unlikely event you ever read this, I’m sorry. I’m a bad son. Yes, the lights did go out at ten, but the TV stayed on, and it was round about midnight on Friday and Saturday evenings that these films were shown. I’m sure my parents would have been horrified if they had known what I was watching. They’d have worried that I’d scare myself witless. As it turned out, I scared myself witless. Nowadays many of these old pictures come across as camp and creaky, but I still love them. 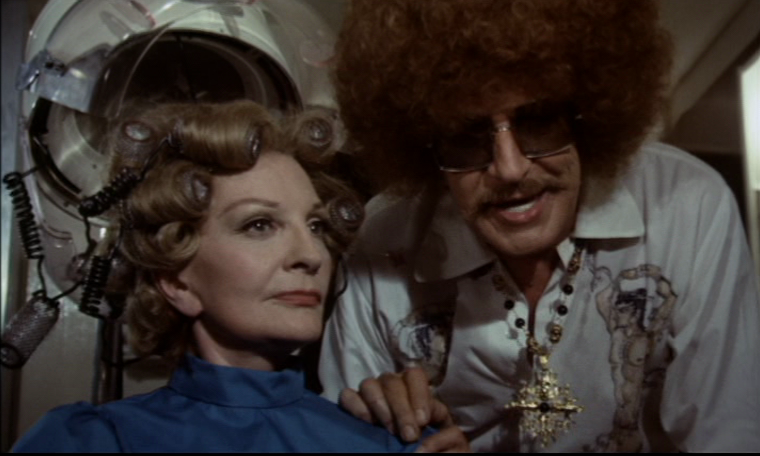 I was probably around ten when I first saw Theatre Of Blood (1973), a wickedly black comic picture starring Vincent Price, Diana Rigg, and a host of fine British character actors. Price plays Edward Lionheart, a failed Shakespearean actor whose performances are savaged by the critics and thus is driven to drown himself in the Thames. Unbeknownst to all he survives and proceeds to exact a bloody revenge on all of them. Those critics who gave him poor notices become the victims of a series of inventive and gory murders imitating Shakespearean death scenes. Price hams it up big time in a number of different guises, not least his insanely memorable portrayal of a camp hairdresser with an afro. If this film was made today, that haircut would have it’s own Twitter account. Oh, and did I mention Diana Rigg was in it? One thing that’s quite unusual for the time is that (as far as I can tell) every scene is shot on location, in and around London. There are no studio sets at all. And it was whilst watching it again recently that I realised that one of the scenes is shot in Kensal Green Cemetery, a huge gothic style graveyard in West London. So, a classic horror movie filmed in a local graveyard – was there really any chance that I wouldn’t pay a visit with a camera? Seriously? In the movie, Lionheart’s daughter Edwina (Diana Rigg) is seen tending his memorial in the mausoleum’s portico. In reality this statue is actually a monument to sculptor Robert William Sievier, but in the movie the face is cunningly disguised to resemble Vincent Price. Christopher Lee plays against type as the good guy in Hammer’s adaption of Dennis Wheatley’s 1934 occult novel. Contains all the elements that Wheatley is famous for. Devil Worship? Check. Sacrificing animals? Check. British superiority and causal racism? Check. I actually own an original publicity photograph of Lee and fellow actors in the scene where they spend the night in the chalk circle whilst Satan’s legions are mustered against them. If I could have my time over again, that would be my ideal job – an on-set photographer. Policeman:The two of you together. That’s fine. But what if one of you is the monster? Peter Cushing: Monster? We’re British, you know. Actually it didn’t. Not a single drop of it in fact. Director Peter Duffell wanted to call the film the more appropriate and refined ‘Death and the Maiden’, but producer and head of Amicus Studios, Milton Subotsky, wanted something more dramatic. This is one of those of Portmanteau horror films – several separate stories connected by a single theme or a location – that were popular ever since 1945’s Dead of Night. In this case, the four stories are linked together by a creaky old house. Beautiful Queen of Horror Ingrid Pitt turns up in one of the segments and takes a bite or two out of a pre-Doctor Who Jon Pertwee. When I was a kid, Ingrid Pitt playing a seductive vampire gave me a funny feeling in the pit of my stomach, but I didn’t know quite what it meant. Another Amicus Portmanteau flick, this time the linking device is Peter Cushing’s seemingly doddery old antique shop proprietor. Think you can put one over on him? Think again. My parents couldn’t understand why the electricity bill went up for the following year after I’d seen this film, but it was that long before I could sleep with the light off. Bits of this still give me the willies even to this day. This entry was posted in Mamiya 645 Pro TL and tagged 645, black and white, film photography, filming locations, ilford fp4, mamiya 645 pro tl, medium format, movie locations, rodinal, semi-stand development, the magnificent seven, theatre of blood. Bookmark the permalink.